Traveling is not complete without a camera. When visiting new places beautiful, shall preserve it as a keepsake or for distribution to family and friends. Each traveler would want a good image results like professional shots. However DSLR camera less suitable for practical problems. While the pocket camera for less than the maximum yield of high-quality photos. Now there is a new breakthrough in the world of professional digital photography to address the needs of the traveler, the Samsung Galaxy Camera. This is the smart camera that gave birth to evolution in the world of digital photography. Unlike ordinary digital camera functions, the Samsung Galaxy Camera is able to give more satisfaction through ease of editing and sharing photos. Powered by the Super Clear LCD measuring 4.8 inches which makes your shots look more crisp and clear. No more restrictions because of connectivity the Samsung Galaxy Camera has 3G and Wi-Fi. So you dapatmeng uploaded photos to social media directly from the camera using the operating system Android 4.1 Jelly Bean. Travelers can install a variety of social media applications like Instagram, Twitter, Path, Facebook from Google Play Store. So if the photo you want to save in Dropbox, shared immediately via social media, in-bluetooth or email, please choose. The whole setting is done in the camera screen. There Auto mode, Smart and Manual. For the traveler who wants to create a beautiful yet practical landscape photos, the Samsung Galaxy Camera has several setting options in Smart mode. There Landscape mode which will highlight the blue and green colors of the objects and modes to capture the shape Waterfall waterfall in the low shutter speed. Stretch of dazzling snow always successful traveler, to immortalize use Snow mode to make more snow white color contrast. As for traveler who like to hunt photo beautiful sunset or sunrise, Dawn and Sunset modes available that will enhance your shots. To capture the moving object such as a traditional dance or carnival, use Action Freeze mode or Continuous Shot mode to capture 20 frames at once. For those who prefer manual settings, the Samsung Galaxy Camera allows you freedom to be creative in all lighting conditions with a choice of ISO 100 - 3200, diaphragm from 2.8 to 8.0 and a shutter speed of 16 "- 1/2000. Travelers also can change the focus position of the desired object by touching the LCD screen. Traveling shots to produce images equivalent professional has never been easier. Performance Samsung Galaxy Camera gahar classified as using a Quad Core 1.4 Ghz processor. So no need to worry about the speed of response when editing photos or video. Create a new masterpiece with ease using the Photo Wizard who has 65 professional editing applications. You can also manage the photos in the camera thanks to the Smart Content Manager. 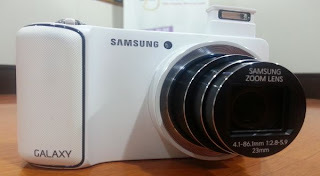 Samsung Galaxy Camera has a quality shooting of 16.3 megapixel camera with 21x Zoom Lens. The quality of the resulting video reaches 1080 pixels (full HD) at 30 fps. Store all your photos and video shooting in the camera's internal memory of 8 GB which can be upgraded up to 64 GB using Micro SD slot. Amazon announced a new comer in the Kindle line of tablet Kindle Fire HD.